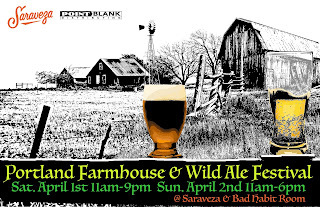 3/14/2017 Portland, OR - The 5th annual Portland Farmhouse and Wild Ale Festival, part of the inaugural Portland Farmhouse Weekend has announced their participating beer and breweries list, official exclusive beer by Logsdon Farmhouse Ales and additional affiliated events. Portland Farmhouse Weekend runs March 31st - April 2nd, 2017 with the main festival Sat. April 1st and Sun. 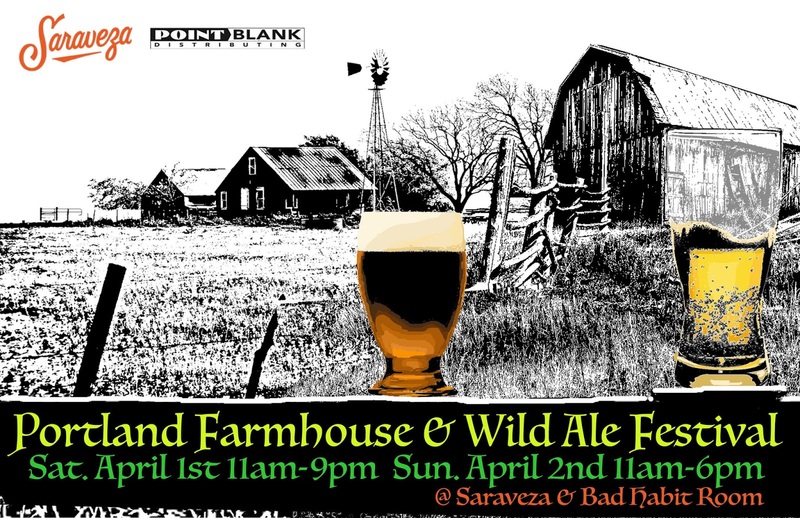 April 2nd featuring over thirty breweries and 80+ beers presented by Saraveza and Point Blank Distributing. 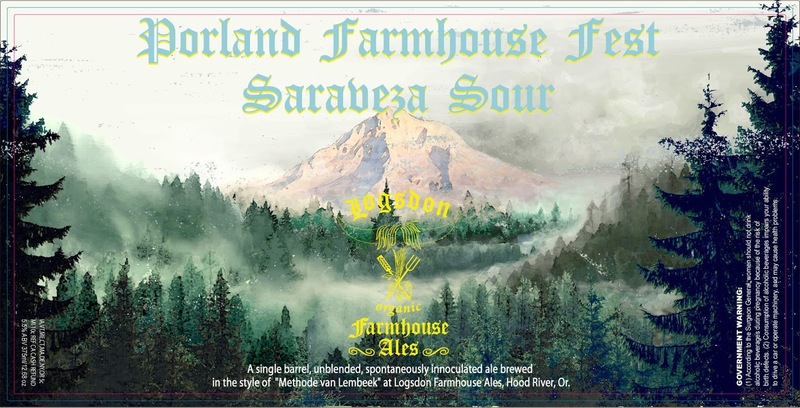 This years Farmhouse Festival features an exclusive new single barrel bottled and limited draft release from Logsdon Farmhouse Ales called "Portland Farmhouse Fest Saraveza Sour." Only forty cases of 375ml bottles and two kegs were made of this unblended, spontaneously inoculated "methode van lembeek"-style beer will be on sale for $13 each. Saraveza has also unearthed two cases of last 2016's official festival bottle release "The Croze" by The Commons Brewery which will be on sale for $12. Participating breweries (subject to change): Logsdon Farmhouse Ales, De Garde Brewing, The Ale Apothecary, Benedictine Brewery, Holy Mountain Brewing, The Commons Brewery, pFriem Family Brewers, Upright Brewing, Alesong Brewing & Blending, Perennial Artisan Ales, Propolis Brewing, Agrarian Ales, Block 15 Brewing, Against the Grain, Blackberry Farms, The Bruery, Great Notion, De Garde, Culmination Brewing, Ruse Brewing, Little Beast Brewing, Reach Break Brewing, Solera Brewery, Stillwater Brewing, Three Magnets Brewing, Urban Family Brewing, Wander Brewing, Engine House No. 9, Wolf Tree Brewery, Yachats Brewing, Matchless Brewing and Sixpoint. The following beer will not be on tap all at once but some at booths and tables outside in a covered tent, and others rotating through the taps inside Saraveza and The Bad Habit Room over the full weekend. This Session Saison safely falls into step with those beers striding confidently along that most fateful walk. Brewed with a dash of spelt and a healthy late hop addition this fine, frothy friend was fermented warm to perfect attenuation and carbed up high for a flavor that is at once bright, rich, juicy and ultra crisp. Strut your stuff, man. ABV: 5.8% IBU: 31.1. Biere de Mars 6%: This traditional spring farmhouse ale is bright a floral with a heavy dose of estate Mt. Hood hops. Two toast level Munich malt and a little Vienna malt make for a beautiful orange tint and balanced maltiness perfect for our balmy, Oregon springs. winter saison 8%: With a simple, clean base of organic pils and pale malts, and a restrained hand of Cascade hops, we let the Belgian Saison yeast shine in this tradition-inspired golden ale. Aromas of spice and stone fruit seem to jump right out of the glass at you, drawing you into its enveloping realm of complex fruit, malt, and spice flavors. Dry and yet rich, Apricity is sure to live up to its definition - the warmth of the sun in the winter. (8.1%): Brewed in the classic style of a strong export Belgian Saison, with organic unmalted heirloom red wheat, organic pilsner malt, and generous additions of freshly dried, Agrarian grown hops, straight from our drier oast. It has all the fruity twangy spicy flavors you want in a good country song. Or rather, saison. (6%): This beer starts with our barn pressed, spontaneously fermented cider that is aged for a year in a used Pinot Noir French oak barrel. The dry, oaky and sour cider is then blended with our bright and fresh malty Biere de Mars to reach a smooth mouthfeel and crisp yet complex tart finish. Our La Tache aged additionally on 3 varieties of wet hops after our traditional dry-hopping stage. Collaboration with Twist Wine Co out of Pacific City. La Tache aged in 2 Bull Run whiskey barrels with 75# of chenin blanc grape must in each barrel. American Wild Ale aged in oak barrels with Peaches. 5.4% Abv. Farmhouse ale aged in oak and acacia barrels and conditioned with Muscat Juice. 8.4% Abv. Wild red ale aged in Pinot Noir and bourbon barrels with cherries. 7.4% Abv. Biere de Mars dry-hopped ale with citrus and spices. 5.6% Abv. Light, rustic and spicy. Brewed with pilsner and wheat, and a touch of sugar, we let the Belgian yeast ferment at its own pace and temperature, usually landing between 78-82 degrees F. ABV 4.7%. NW/Belgian Wild Ale. The beer started as a Belgian IPA, and evolved into a wild ale. An accident, my fault, for sure. Citrus, fruit and subtle spice flavors from the grains and yeast are in balance with the hops from our own farm. And as the beer ages, the barn is finding its way into the flavor. ABV 7.0%. Inspired by classic Old World farmhouse ales, balanced by the bright character and nuances of New World hops, this golden dry-hopped saison features Wakatu, Equinox, and Comet hops. 6.3% Abv. Bière de Mars. Our nod to Northern France's springtime farmhouse ales, this Bière de Mars is inspired by budding flowers, new growth, and the sun emerging from its winter slumber. Its blend of North American malted barley, French Pilsner malt, and locally-grown white wheat produces a rustic grist character that is complemented by gentle hopping with Oregon and European varietals and fermentation with a pair of characterful yeast strains. Together, they produce a bright and lively farmhouse ale offering nuanced complexity and a crisp, refreshing finish. Wild house cultured saison brewed exclusively for Block 15’s spinoff restaurant & bar Les Caves in Corvallis, Oregon. 5.1% Abv. Tonnellerie Rue is a special variation of our rye saison that has been 100% fermented in oak barrels. Using this more traditional storage technique during the fermentation process adds further complexity to an already complex beer by allowing the natural yeast and bacteria, still nestled within the porous oak from previous fermentations, to eat away at the wort’s sugars while it slowly evolves into delicious beer. The final product is dry and earthy with a slight sour tinge, light rye spice and earthy funk. Jardinier, which is French for “gardener,” was inspired by the fresh, sessionable beers so often found on the Belgian dinner table. Bright and flavorful with an assertive hop character, Jardinier is a perfect beer for any occasion, casual or ornate. 4.5% Abv. designed to showcase the similarities and differences between four strains of Brettanomyces, which the cool kids call “brett”. This release features the Brettanomyces Claussenii strain. 6.5% Abv. designed to showcase the similarities and differences between four strains of Brettanomyces, which the cool kids call “brett”. This release features the Brettanomyces Lambicus strain. 6.5% Abv. Lambic-style ale aged in oak barrels with pinot noir grapes. 7% Abv. One of the oldest barrels from our stock, a lambic influenced sour ale. We added a hefty harvest of whole cluster Southern Oregon grown Tempranillo grapes from a favorite vineyard. Big rustic and spicy fruit aromas with a bracing acidity, and earthy backdrop. 7% Abv. We’re pleased to introduce Elements of Composition, a blend of beer and friendship spanning the course of years. In February 2016, brewers from De Garde Brewing, Jester King Brewery, and Sante Adairius Rustic Ales in met in Tillamook, Oregon to blend beer from each of their respective breweries. Three year old, 100% spontaneously fermented beer from De Garde was blended with two year old, 100% spontaneously fermented beer from Jester King, and mature, foudre aged saison from Sante Adairius. The result is a beer distinct from, but not greater than, the sum of its parts. 6.2% Abv. Wild red ale aged in oak with raspberries and cherries. 6.5% Abv. A wild farmhouse ale aged in oak wine barrels with nectarines. 7.1% Abv. Our version of a barrel-fermented and barrel-aged Berliner-Weisse, but fermented with ambient yeast and bacteria. Tart with citrus and fruit notes, a subtle grain character, and a hint of funk. 2.3% Abv. Brewed with Tayberries, fermented in oak with a house brett strain. 6.4% Abv. Petal of Roselle' is a Farmhouse Ale brewed with Continental Pilsner, Munich malts, white wheat and oats. The beer was fermented with a Belgian yeast strain and conditioned in French wine barrels with a mixed culture of bacteria & brett for two months. The Petal of Roselle (hibiscus flowers) were added to the beer three weeks before packaging, to add a soft floral flavor, and beautiful pink color. Farmhouse saison crafted with European malts and Noble hops, and then fermented entirely with Brettanomyces yeast. Drinks dry and crisp with a mildly tart, fruity and complex finish. Tart Wheat Ale brewed with Belgian malts and Noble hops. Fermented with a blend of unique Saccharomyces yeast and then conditioned with lactobacillus. Logsdon's first wild ale, this is a tart, juicy ale brewed in the farmhouse tradition and opened to wild fermentation. 7.8% Abv. A quadrupel based beer with intense Kriek flavor aged for 4 months in bourbon barrels with cherries. This beer was compiled by the Logsdon crew of 4 with 4 of our initial seizoen yeast strains and 4 more cultures of Brettanomyces and lactic bacteria. Krieke Vier is a big beer with great flavor intensity and incredible cherry complexity that is smooth and easy to drink. 9.2% Abv. Special Brettanomyces yeast provides added dryness and crisp complexity to the Seizoen Bretta. Bottle conditioned with pear juice for a natural carbonation. Elderflower Saison with Brettanomyces. 7.5% Abv. A rye saison spiced with ginger and hibiscus. Aged for 6 months in Brooklyn Winery red wine barrels innoculated with a healthy culture of Brett. Funky, light acidity, lots of bright fruit character. Our classic saison brewed with pilsner malt, wheat, corn and Pekko hops blended with a 4 year old Solera barrel (Gen. 1) for bright acidity. 6.5% ABV, 22 IBU. 100% oat malt saison fermented with multiple brettanomyces strains and dry hopped with Galaxy & Pacific Gem. 6% Abv. Wild IPA brewed with Pineapples. 6.7% Abv. Multigrain brett Saison brewed with Buckwheat and Rye. 8.5% Abv. pH 3.2 Lacto, Brett, and Sachromyces combine in a completely anerobic fermentation to create a lip puckering, yet refreshing, summer sour ale. Dry hopped with Amarillo to accentuate the fruity character. This beer is not a kettle sour; live Lacto! 5.6% Abv. Pitch black with dank hop notes and a spicy finish this black saison hits all the notes with a powerful malt foundation, assertive hopping, and a blend of Logsdon’s house saccharomyces yeast along with Three Magnets blend of sacc and brettanomyces. 7.5% Abv. A collaborative two cask blend of light saisons from Ruse and Upright, both aged in wine casks with fresh nectarines and brettanomyces. A mixed culture fermentation (house saison yeast, Brett, and Pedio) with pomegranate. Its not a fruited sour, by any means. Its a traditional wild fermentation that we kegged and have been aging out for a few months. The use of Idaho 7, Chinook, and Cashmere hops in this hoppy saison bring out a juicy, fruity and citrusy character. COST: $25 General Admission ticket for a branded glass and 10 drink tickets, additional tickets $1, 4oz pours 1-4 tickets.